Stephen Robert Irwin (February 22, 1962 – September 4, 2006), known simply as Steve Irwin and nicknamed "The Crocodile Hunter," was an iconic Australian television personality, wildlife expert, and conservationist. 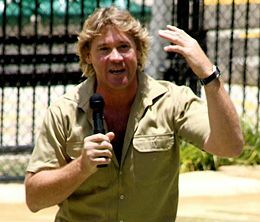 He achieved world-wide fame from the television program The Crocodile Hunter, an internationally broadcast wildlife documentary series co-hosted with his wife Terri Irwin. Together, they also co-owned and operated Australia Zoo, founded by his parents in Beerwah, Queensland. Crocodile Hunter was broadcast in 137 countries in 1999, with as many as 500 million viewers. Irwin's enthusiastic, on-camera style, his earthy Australian accent, signature khaki shorts, and signature phrase, "Crikey!" were known worldwide. An avid promoter for Australian tourism, Irwin developed Australia Zoo into Queensland's biggest tourist destination in 2002. A passionate conservationist, he was especially concerned with endangered species and deforestation. Charitable organizations with which he was associated included Wildlife Warriors Worldwide and International Crocodile Rescue. Irwin died in 2006 after his chest was fatally pierced by a stingray barb while filming in Australia's Great Barrier Reef. News of his death caused worldwide shock and widespread memorials. Born on his mother's birthday to Lyn and Bob Irwin in Essendon, a suburb of Melbourne, Victoria, Australia, Irwin moved with his parents as a child to Queensland in 1970. He described his father as a wildlife expert interested in herpetology, the branch of zoology dealing with the study of reptiles and amphibians, while his mother was a wildlife rehabilitator. After moving to Queensland, Bob and Lyn Irwin started the small Queensland Reptile and Fauna Park, where their son, Steve, grew up around crocodiles and other reptiles. As a boy, Irwin took part in daily animal feeding, as well as care and maintenance activities. On his sixth birthday he was given a 12-foot scrub python. He began handling and wrestling crocodiles at the age of nine. Irwin graduated from Caloundra State High School in 1979. He soon moved to Northern Queensland, where he became a crocodile trapper, removing crocodiles from populated areas where they were considered a danger. He performed the service for no charge, with the quid pro quo that he be allowed to keep the crocodiles for the park. Irwin feeding a crocodile at Australia Zoo. The family wildlife park was eventually turned over to Irwin, who renamed it "Australia Zoo" in 1992. He had met Terri Raines at the park, while performing a demonstration. The two married in June 1992, in Terri's hometown of Eugene, Oregon. The footage of their crocodile-trapping honeymoon, shot by John Stainton, became the first episode of The Crocodile Hunter. The series debuted on Australian television in 1996, and by the following year the show had made its way onto North American TV, followed soon thereafter in the UK. Irwin went on to star in other Animal Planet documentaries, including The Croc Files, The Crocodile Hunter Diaries, and New Breed Vets. In 1998, Irwin worked with producer and director Mark Strickson to present The Ten Deadliest Snakes in the World. By 1999, his United States popularity led to his first appearance on The Tonight Show with Jay Leno. By this time, the Crocodile Hunter series was broadcast in 137 countries, reaching as many as 500 million people. Irwin's exuberant and enthusiastic presenting style, broad Australian accent, signature khaki shorts, and catchphrase "Crikey!" became known worldwide. 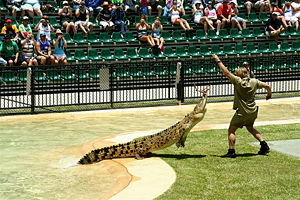 Irwin's operations grew to include the zoo, the television series, Steve Irwin Conservation Foundation (renamed Wildlife Warriors), and International Crocodile Rescue. Improvements to the Australia Zoo included the Animal Planet Crocoseum, the rainforest aviary, and Tiger Temple. He was also a keen promoter for Australian tourism in general and Queensland tourism, in particular. In 2002, the Australia Zoo was voted Queensland's top tourist attraction. In 2004, Irwin was appointed ambassador for The Ghan, the passenger train running from Adelaide to Alice Springs in the central Australian Outback, when the line was extended all the way to Darwin on the northern coast that year. In January 2006, as part of the United States' "Australia Week" celebrations, Irwin appeared at the Pauley Pavilion, UCLA in Los Angeles, California. During an interview on The Tonight Show with Jay Leno, Irwin announced that Discovery Kids would be developing a show for his daughter, Bindi Sue Irwin. The show, Jungle Girl, was tipped to be similar to The Wiggles movies, with songs that surround a story. A feature-length episode of Australian kids TV show The Wiggles entitled "Wiggly Safari" was dedicated to Irwin, and he was featured heavily in it with his wife and daughter. Also in 2006, the American network The Travel Channel had begun to show a series of specials starring Irwin and his family as they traveled on cross-country tours. Irwin enthusiastically joined with the Australian Quarantine and Inspection Service in a media campaign to promote Australia's strict quarantine/customs requirements, with advertisements and posters featuring slogans such as, "Quarantine Matters! Don't muck with it." His payments for these advertising campaigns were directed into his wildlife fund. Irwin was a passionate conservationist and believed in promoting environmentalism by sharing his excitement about the natural world rather than preaching to people. He was especially concerned with conservation of endangered animals and land clearing leading to loss of habitat. He considered saving endangered species to be the most important part of his work. Irwin bought large tracts of land in Australia, Vanuatu, Fiji, and the United States, which he described as "like national parks," and stressed the importance of people realizing that they could each make a difference. He urged people to take part in considerate tourism and not support illegal poaching through the purchase of items such as turtle shells or shark-fin soup. Irwin and his father discovered a new species of turtle that now bears his name, Elseya irwini — Irwin's Turtle—-a species of turtle found on the coast of Queensland. He also founded the Steve Irwin Conservation Foundation, which was later renamed Wildlife Warriors Worldwide, and became an independent charity. British naturalist David Bellamy lauded his skills as a natural historian and media performer. He also helped to found a number of other projects, such as the International Crocodile Rescue, as well as the Lyn Irwin Memorial Fund, in memory of his mother, who was in a fatal car crash in 2000, with proceeds going to the Iron Bark Station Wildlife Rehabilitation Center. On January 2, 2004, a controversial incident occurred during a public show when Irwin carried his one-month-old son, Bob, in his arm while hand-feeding a chicken carcass to a 12-foot saltwater crocodile. Comparisons were made in the press to Michael Jackson's dangling his son outside a multi-story hotel window. Child-welfare groups, animal-rights groups, and some of Irwin's television viewers criticized his actions as irresponsible and tantamount to child abuse. Both Irwin and his wife claimed that Irwin was in complete control of the situation, since he had dealt with crocodiles since he was a child, and thus neither he nor his son were in any danger. He also showed footage of the event shot from a different angle, demonstrating that they were much further from the crocodile than they had appeared in the widely publicized clip. Terri Irwin said their child was in no more danger than one being taught to swim. No charges were filed, but Irwin told officials he would not repeat the action. The incident prompted the Queensland government to change its crocodile-handling laws, banning children and untrained adults from entering crocodile enclosures. On September 4, 2006, Irwin was fatally pierced in the chest by a stingray spine while snorkeling at the Great Barrier Reef, at Batt Reef, off the coast of Port Douglas in Queensland. He was in the area filming his own documentary, Ocean's Deadliest, but weather had stalled filming. Irwin decided to take the opportunity to film some shallow water shots for a segment in the television program his daughter Bindi was hosting, when, according to colleague John Stainton, he swam too close to one of the stingrays. "He came on top of the stingray and the stingray's barb went up and into his chest and put a hole into his heart," said Stainton, who was on board Irwin's boat the Croc One. Crew members aboard the boat called the emergency services in the nearest city of Cairns and administered CPR as they rushed the boat to the nearby Low Islets to meet a rescue helicopter. Medical staff pronounced him dead when they arrived a short time later. Irwin's body was flown to a morgue in Cairns. Terri Irwin recently reported that Irwin had an ongoing premonition that he would die before he reached age 40. He was 44 years old. News of his death prompted a worldwide grief. Australian Prime Minister John Howard expressed his "shock and distress" at the death, saying that "Australia has lost a wonderful and colorful son." Several Australian news websites went down because of high web traffic. 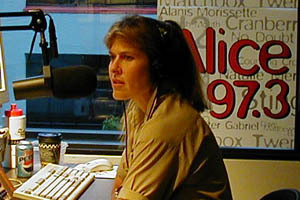 Talk-back radio experienced a high volume of callers expressing their grief. Flags at the Sydney Harbor were lowered to half staff in honor of Irwin. The United States feed of the Animal Planet, cable-television channel aired a special tribute to Steve Irwin that started on Monday, September 4, 2006. The tribute continued with the Animal Planet channel showing highlights of Irwin's more than 200 appearances on Discovery Networks shows. Thousands of people visited Australia Zoo to pay tribute to the deceased entertainer and conservationist. The day after his death, the volume of people visiting the zoo to pay their respects affected traffic so much that police reduced the speed limit around the Glass House Mountains Road and told motorists to expect delays. Queensland Premier Peter Beattie extended the offer of a state funeral to Irwin's family, an honor also agreed to by Prime Minister John Howard. The family decided that such a funeral would not be appropriate, a sentiment echoed by many Australians outside media and political circles. Irwin's father, Bob Irwin, stated that his son would not have wanted such an honor, and would want to be remembered as an "ordinary bloke." Beattie stated he would honor the decision of the Irwin family regarding their arrangements. Family and friends thus attended a private funeral service for Irwin held at Caloundra on the afternoon of September 9, 2006. The naturalist was buried in a private ceremony at the zoo on the same day. In 2001, Irwin was awarded the Centenary Medal for his "service to global conservation and to Australian tourism." Shortly before his death, he was to be named an adjunct professor at the University of Queensland's School of Integrative Biology. Ocean's Deadliest aired for the first time on the Discovery Channel on January 21, 2007. On the same day, the Animal Planet cable network ended The Crocodile Hunter with a series finale entitled "Steve's Last Adventure." The documentary spanned three hours, with footage of Irwin's across-the-world adventure in locations including the Himalayas, the Yangtze River, Borneo, and the Kruger National Park. Animal Planet also created the Steve Irwin Crocodile Hunter Fund called the "The Crikey Fund" to "provide a way for people from across the globe to make contributions in Irwin's honor to support wildlife protection, education and conservation." 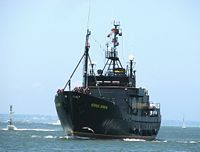 The Sea Shepherd Conservation Society ship MV Steve Irwin was named in his honor, christened by his wife Terri, who said "If Steve were alive, he'd be aboard with them!" Films featuring Irwin include: Dr. Dolittle 2 (2001), The Crocodile Hunter: Collision Course (2002), and Happy Feet (2006). Numerous conservation projects and animal parks have been named in his honor. ↑ Enough Rope with Andrew Denton - episode 30: Steve Irwin, October 6, 2003, ABC. Retrieved February 24, 2009. ↑ Australia stunned by death of "modern-day Noah", Retrieved February 24, 2009. ↑ Croc hunter Irwin believed he'd die young: wife, Retrieved February 24, 2009. ↑ Irwin brought joy to millions: PM, The Australian, September 4, 2006. Retrieved February 24, 2009. ↑ Father rejects state funeral for 'ordinary bloke' son The Age, September 7, 2006. Retrieved February 24, 2009. This page was last modified on 22 April 2014, at 18:15.